One of the hottest tickets at the Olympics, the GB track cycling team will have the weight of the nation of their shoulders after their record breaking performances in Beijing has helped to put cycling firmly in the spotlight. 25 medals were won by Team GB and ParalympicsGB in the velodrome during the Beijing 2008 Games. Organisers have done everything they can to make this the world’s fastest track, and are hoping world records will fall. By tailoring the track geometry to be 42 degrees at its steepest point and setting optimum temperature and environmental conditions cyclists are expected to reach speeds of 75mph. There are ten Olympic cycling events – five for men, five for women – in the Sprint, Team Sprint, Keirin, Team Pursuit and the Omnium. Sprint: A one on one battle that’s all about speed and tactics. Riders compete to be the best over three racers per round. Team Sprint: Two-man female teams sprint over two laps in this event. Keirin: An eight lap race where the riders are paced by a small moped called a derny. As the derny increases speed riders jostle for the best position behind it. With two laps to go the derny moves off the track and the sprinters race for the finish. Team pursuit: An endurance event lasting 3km, with teams of three (for women) starting on opposite sides of the velodrome, and the aim is to catch the other team. Riders take in turn to lead their team for around half a lap before moving to the back of the team to let a rider with fresh legs take the lead. – Elimination race – the 24 riders race as a bunch and every two laps the last rider over the line will be eliminated. The final squad selection for team GB won’t be announced till early June but most spots are now already finalised. It’s fair to say Team GB are medal contenders in each and every event. Victoria Pendleton, sprint champion in Beijing, will race in the Sprint, Team Sprint and Keirin events as she bids for triple gold glory. She will be joined by rising star Jess varnish in the Team Sprint. Laura Trott, who broke two world records at the World Championships in Melbourne in April, will race the Omnium and most likely the Team Pursuit too. The final two slots for the Team Pursuit will be chosen from Jo Rowsell, Dani King and Wendy Houvenaghel. The former two joined Trott in Melbourne and twice broke the world record, coming home with gold. But Houvenaghel, who won a silver in Beijing in the individual pursuit (no longer an Olympic event) is a three time world champion in the team pursuit herself, leaving selectors with a hard decision to make. It’s got to be the on-going battle between Victoria Pendleton and Australian Anna Meares. Although Pendelton came away with the sprint title from the recent worlds, it was the Australian rider who looked on stronger form with two golds, a silver and a bronze. But as these home Games are likely to be the Britons last competition before retiring, she will be more determined than ever to come away with gold. Who’s the gold medal favourite? As the selection rules changed after Beijing to only allow one representative from each country in any one event, don’t expect to see Team GB dominating the podiums like they did in 2008. Having said that Great Britain won more medals in the Olympic events at the recent world champs than any other country – including close rivals Australia. 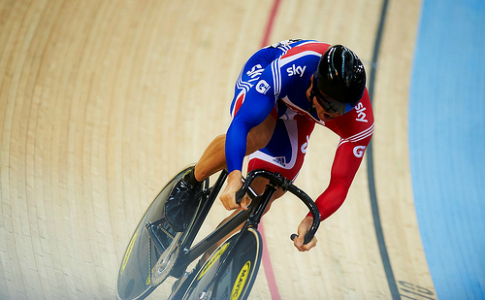 The bikes used in the velodrome have no gears, or brakes, and a fixed wheel meaning their legs must keep turning. Riders must stop by applying pressure to the pedals. Victoria Pendleton answers your questions!